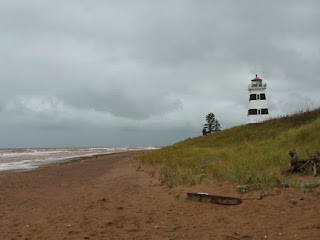 We continued west until we hit the West Point Lighthouse, a still used and working lighthouse from 1876. 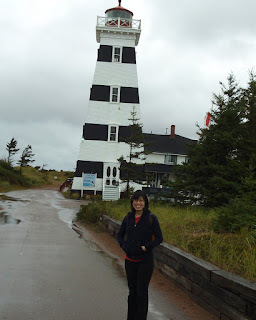 And, you can climb to the very top of the light house, reading all the lighthouse factoids and lurid stories of shipwrecks on your way up the many stairs. As I said, you have to mount many stairs to get to the top. These steps are quite steep and rather crooked. At the last landing, Squatchie stepped on a loose board. As the board raised, he stopped like a statue. And turned around. And went back down. Who knew Squatchies were scared of heights? I guess that is why sasquatches do not live in trees. I, however, did make it all the way up. 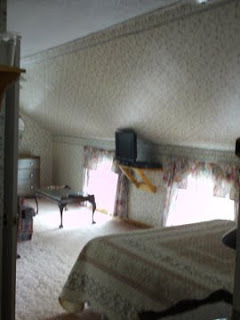 It is perhaps all for the best that Squatchie did not get there for the view from the top is actually a bit dizzying. 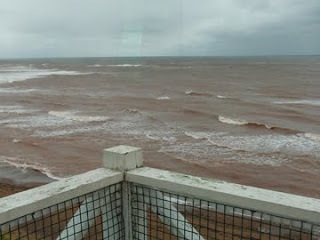 On this part of PEI, the wind and waves are much wilder making the water red. 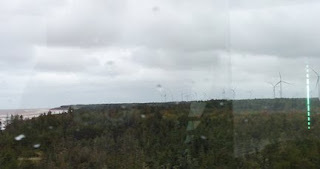 And the windmills pop above the trees like giant metal flowers: I didn't tell Squatchie, but I was a little relieved to get back down!